Right after we had our house built, a garden landscaper was contracted by the architect-builder to do some landscaping on our front yard. As we wanted some lawn grass in front, the garden landscaper dug up holes along a path and poured concrete on these holes. 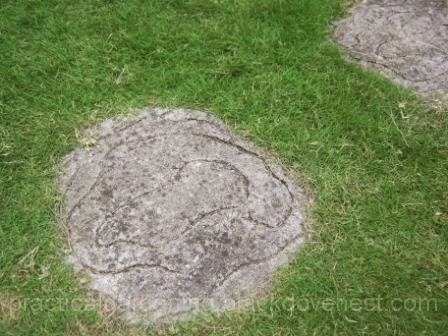 These would be the faux garden stepping stones on the lawn. Garden stepping stones are a great alternative to concrete paving to minimize lawn damage due to foot traffic. The concrete garden stepping stones looked very nice at first. With the neutral grayish color of concrete, they looked like natural rock. Over time though, dirt and stains discolored the garden stepping stones. The photo below shows one of them. Here are a few simple steps to clean the garden stepping stones and then paint them for a fresh new look. 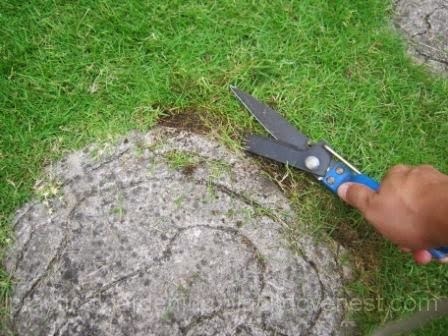 Pry away the surrounding turf on the garden stepping stone. Since you will be cleaning and painting the garden stepping stones, then this would be a good opportunity to trim back the garden lawn grass surrounding the stones. In the above picture, the garden stone is flush with the lawn grass' height and looks buried. 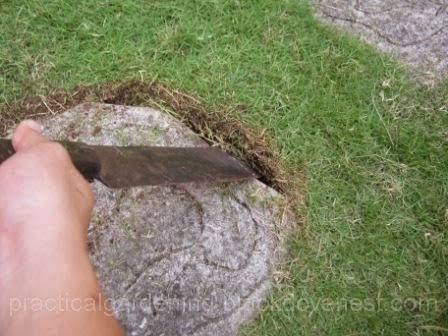 With a flat trowel or a machete, dig along the edges of the garden stepping stone. Pry out the surrounding turf so the side edges of the garden stepping stone are exposed. 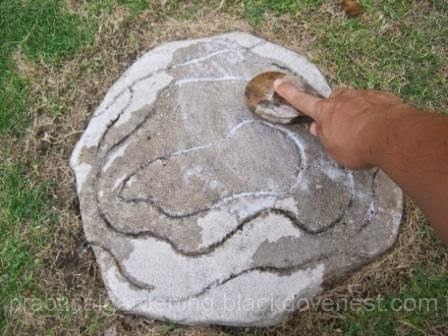 Remember, you'll be painting these garden stones so try to expose at least an inch below the ground level. Be careful not to chip the concrete garden stones with the trowel or machete. Cut the surrounding excess grass turf. With a pair of garden grass scissors, cut away the pried out turf. Remove turf to expose an inch below the ground level. If the grass turf is too thick or grass roots are exposed, use pruning shears instead. Cut away the exposed thick grass roots as you would when cutting twigs. Wash and clean the garden stepping stone. Prepare the garden stepping stones for painting by cleaning the surfaces thoroughly. Use detergent and water and scrub away the dirt and stain with a stiff-bristled brush. 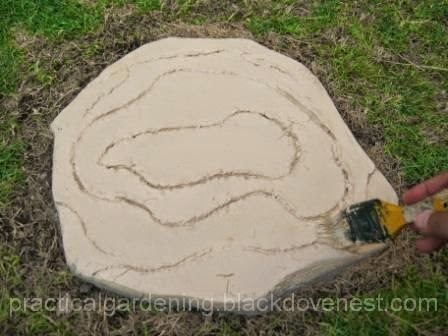 If the garden stepping stone has an etched design, brush away the dirt and small stones that may have embedded. If washing and scrubbing with the detergent does not remove the stains, consider a weak bleach solution. Mix bleach with water at a 1:10 ratio. Scrub the bleach solution on the surface of the garden stepping stone. Let the surface dry for a few minutes. Paint the surface of the garden stepping stone. Two things need to be considered when you're about to paint the garden stepping stones. One, it has to be a clear day with no rain in sight. Latex paint is water-soluble. A strong rain immediately after painting could wash away the latex paint. Second, schedule the painting when you don't have busy projects in the lawn. Remember, it will take a while to fully dry the two coats of paint so you won't be stepping on them for some time. So it's best to minimize foot traffic in the garden as the paint dries. Choose paint color that complements your house color. Earth tones look natural on the garden lawn. Apply two coats of paint. Let the first coat dry thoroughly prior to the second coat. It's best to keep it simple. You can apply multiple shades of color, but remember that when the paint job on one of the stones get damaged, it may be difficult to replicate the same design and same set of colors in the future. If you have issues with the paint being slippery or too slick, consider applying non-slip or anti-slip paint. Here's a an easy homemade anti-slip paint that you can make. Paint as far down along the sides as you can. When the lawn grass grows back, you can be sure there won't be unpainted spots on the garden stone peeking out. Replace some garden soil on the dug out areas to even out the lawn grass' surface as it grows back. I am searching from the pch front page today , to win my dream home and Garden around my house I have plans to build a fence around my home and Garden within , and I will love to pick up the stepping stones and design them at the fence, and many more activities will be in my garden farm in the house, if I win my house will be a unique house, thanks.